Coach Tim Beckman announced this week the hiring of Tom Brattan. The veteran coach brings over 30 years of experience to the Illini and comes to the University from Maryland, where he coached for 13 seasons. CHAMPAIGN, Ill. – University of Illinois head coach Tim Beckman announced the hiring of Tom Brattan as offensive line coach on Thursday. Brattan joins the Fighting Illini staff after spending the last 13 years as offensive line coach at Maryland, and he also spent time at Stanford and Northwestern. “I was extremely pleased to find someone of Tom Brattan’s stature at this late date,” Beckman said. “He is very well respected around the nation as a coach, as a recruiter and – maybe most importantly – as a person. Tom has experience of working with Al Seamonson and Tim Banks during his time at Maryland, while also having a Big Ten background from eight years at Northwestern. I’ve never gotten so many calls of support during a coaching search as I did for Tom. “He already has some terrific relationships with high school coaches in the Chicago area, which gives him a great recruiting start in that important region. We are very fortunate to find someone with all the characteristics and experience that Tom brings to Illinois. He will have to hit the road running when we start our staff meetings on Monday and practice on August 4, but I am confident that he will be able to do that." Brattan is a 37-year coaching veteran, including 31 years at the collegiate level. During his 13 years in College Park, he helped the Terrapins to eight bowl games and some of the best offensive seasons in school history. Maryland broke the single-season school scoring record in 2001 and the single-season total offense mark in 2003. Brattan produced five players who earned six All-America honors in his time at Maryland. His linemen also garnered 17 All-ACC laurels, including seven first-team accolades. 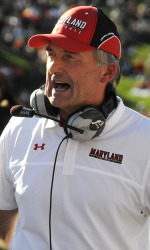 He helped guide Maryland to eight bowl games and three consecutive 10-win seasons from 2001-03. He also has prepared a number of players for the next level with 18 former players reaching the NFL, including Bruce Campbell, a fourth-round choice of Oakland in the 2010 NFL Draft. Brattan’s offensive line opened holes for four of the top eight running backs in Maryland history and three of the top rushing seasons ever in College Park. Lance Ball piled up 2,487 yards from 2004-07, Bruce Perry gained 2,424 yards from 1999-2003, Davin Meggett posted 2,411 yards from 2008-11 and Da’Rel Scott gained 2,401 yards from 2007-10. In addition, Perry’s 2001 season (1,242 yards), Chris Downs’ 1,154-yard campaign in 2002, and Scott’s 1,133 yards in 2008 account for three of the eight 1,000-yard seasons in Maryland history.